A judge in Manchester has condemned Liverpool Striker Luis Suarez for refusing Patrice Evra’s handshake at Old Trafford last month; an act that caused an Eccles man to become so enraged he hurled at TV remote control at his wife’s face. Speaking at Manchester Magistrates court Judge Taaffe said of Suarez ‘The actions of Mr Suarez were at best ill-considered and at worst the actions of a petulant individual who behaved like a spoilt child and brought contempt on both his club and the many professional footballers who conduct themselves properly week-in, week-out. 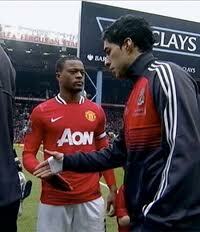 Although the judge absolved Suarez of any direct responsibility for the assault, the court heard how Mr. Graham Trelfa of Eccles had been angered by the Liverpool striker’s refusal to shake United captain Patrice Evra’s hand and as a result he had flung the remote control into his wife’s eye, promting her to call the police. Mr. Trelfa, who has a history of assault, had tried to blame Luis Suarez for his actions but the judge accused him of missing the point. While he disapproved of Suarez’ behavior Judge Taaffe said ‘In my judgement it (the assault) would've occurred sooner or later as it's quite clear you have an anger problem and have behaved in a bullying fashion for many years towards your partner without any thought for the effects it would have. Trelfa was given a 12 month community order and a fine of £85.00. City going as well as expected. Who should start against Wolves? City drop below the curve.